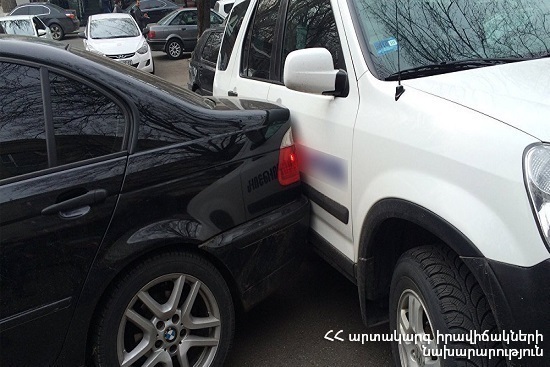 On April 14, at 15:38 an emergency call was received to “911” service that a car accident had occurred at the crossroads of Ayvazovski street and Artsakh avenue, Yerevan, there was a gas leak, the rescuers’ help was needed. A fire unit from the fire and rescue squad of the rescue service of MES of RA dispatched to the scene. It turned out that “Honda Fit” (driver A. A. born in 1978) and “Opel Zafira” (driver H. M. born in 1965) cars had collided. H. M. was rendered necessary medical aid at the scene: there was no need of hospitalization. The rescuers disconnected the automotive battery and closed the gas valve of “Opel Zafira” car. Your official request or application to the Ministry of Emergency Situations is henceforth subject to transparent procedures. Our website informs you as to which agency or official is currently in charge of your hand-delivered or mailed request or application.